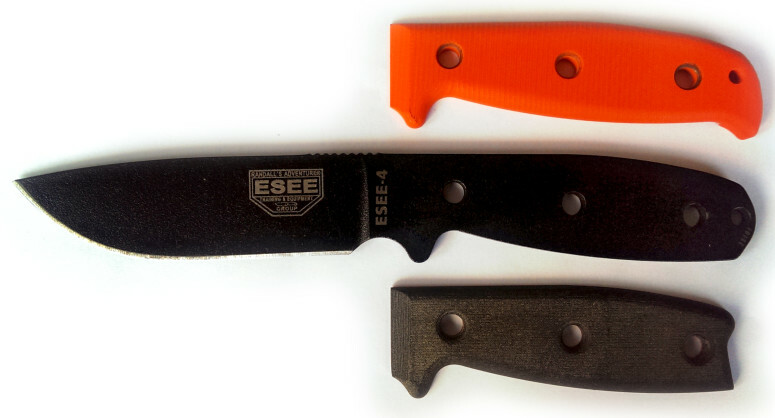 Some time ago we reviewed the fantastic ESEE-4, ESEE-5 and the ESEE-6 knives. These are great, rugged knives, primarily designed for survival rather than regular outdoors situations, and in spirit the American equivalents of the Swedish Fällkniven F1, S1 and A1 knives. However, one thing that some have been less happy about with these knives, is the grip. For people with bigger hands the ESEE-4 in particular has felt a bit too short and thin, especially with extended use. Unfortunately it was also difficult getting your hands on extra handles, but as the knives were designed with hex-nut fastening for the handles, you could theoretically replace the original handles with something else. Back in 2010 this was picked up upon by Dale Stoops and his company The Knife Connection who then started producing custom made handles for the ESEE knife line and the response was instant and very positive. I have been testing the handles for the ESEE-4, and the ESEE-5/ESEE-6 for some time know and will try to share my impressions here. To begin with, while most of the original handles are made from canvas and linen Micarta, these CNC machined handles are made from G10, which really is just another name for fibreglass Micarta. Still, according to lab tests, G10 is a bit stronger than other variants of Micarta, but for most of us this will probably never be noticeable as all variants of Micarta are very strong and durable. One ESEE-4 variant also comes with G10 handles to begin with. The shape of the handles however, is far more important and I will return to that shortly. The handles also come with a lifetime guarantee, but given the material we doubt you will be able to wear them out, at least not before the blade is. Each set of handles comes with two hex wrenches and the mounting hardware needed for securing the new handles to the blade, meaning you can change handles in just a couple of minutes. Simple instructions on how to do this is of course also included in the little zip-lock plastic bag, and it is dead easy to do. Just make sure that the handles line up with the tang properly before securing them tightly. The handles come in many different colour combinations, ranging from quite discrete to outright flamboyant. Of the two handle designes I have tried, the changes are quite different. The ESEE-4 handle is distinctly longer, about half an inch and has thicker belly with a ridged pattern for better grip. It has an added pinkie hook instead of the earlier angular barrel shape and it is very comfortable to use, much more so than the original handle. The extended bit has its own small hole for a lanyard covering the hole in the tang, but is smaller than the original hole in the tang. This extension also completely covers the back-end of the tang, which is a small trade-off as that means you can no longer hammer the back. Given the size of the knife, hammering the tang shouldn’t be much of an issue for most people though, but it is something to consider depending on how you regularly use your knife. The handles for the ESEE-5 and the ESEE-6 are identical, and the outline of the TKC handle for these follows pretty much the same shape as the original, but is slightly shorter in the forward part, but only so that it doesn’t affect the finger choil. More noticeable though is that it has a thicker belly, meaning the grip will be more comfortable for bigger hands. And with that, TKC has also been able to round off the grip more, making it more comfortable even for normal-sized hands. This grip too, like that of the ESEE-4, quite distinctly changes the feel of the knife, from that of a rugged and simple knife to a sleek, comfortable and even more professional knife that is a pleasure to use, even over extended periods of time, thus making the knifes far better for bushcrafting and general outdoors use. That said, for the ESEE-5, which is a beast that is very much designed for survival, I don’t feel quite the same need for a sleek handle, as it is not really good for carving and cutting. TKC not only sells these handles, but also complete ESEE knives and even blank blades at good prices, meaning you can buy a blank and add whichever of the TKC handles you like. That is a pretty cool thing. Additionally, TKC also offers standard and custom sheaths, sharpeners and even some outdoors and survival gear.